Williams College is a highly competitive school and its admissions statistics make Williams College one of the 50 most competitive schools for undergraduate admissions globally. 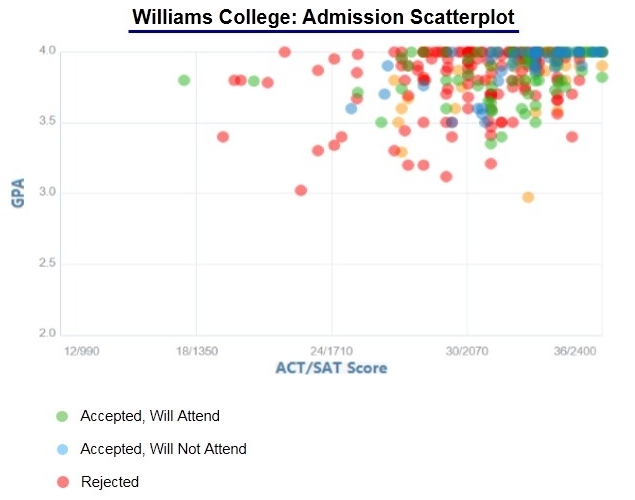 Similar to the trends across all top schools, Williams College acceptance rates have continued to decline over the past 8 years and will almost certainly continue to do so into the future. 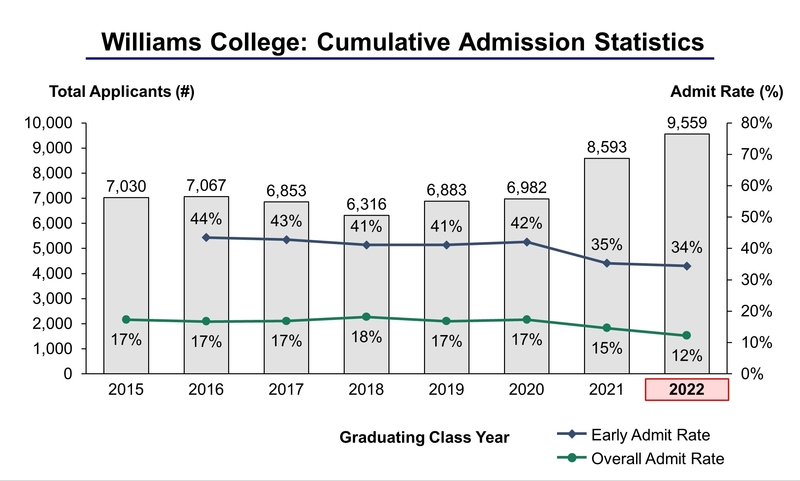 The Class of 2022 was the single most challenging year to be admitted to Williams College ever. For the Class of 2022, 9,559 students applied to Williams College of which 1,163 students were accepted, yielding an overall acceptance rate of 12.2%. Overall applications increased by 11.2% over last year (2021 to 2022) from 8,593 to 9,559. For the Class of 2022, 258 students were admitted through the early admissions process. Total early applications totaled 750, yielding an early acceptance rate of 34.4%. Early applications increased by 3.0% over last year (2021 to 2022) from 728 to 750. Williams College is located in Williamstown, Massachusetts and is situated between the foothills of the Berkshire Mountains and the fringes of urban settings. Established in 1793, Forbes ranks Williams College as the number one top college in America, first in private colleges, first in the Northeast and third in Grateful Grads, as of 2015. The elite school has thirty-six majors available with no required courses; the exception being that all students must complete three arts and humanities courses, three social sciences courses and three science and math courses. Williams College is known to attract talented, highly motivated students and faculty. Williams College is also known to be first for many things, such as being the world’s first society of alumni, the first to wear caps and gowns for graduations, and the first to host an intercollegiate baseball game. More than 60% of Williams College graduates have gone on to earn at least one graduate or professional degree, with the most popular degrees being in the areas of management, education, law, and health care. Some of Williams’ most notable alumni include: Kristin Forbes, Associate Professor of International Management at the MIT Sloan School of Management, and Member of the Council of Economic Advisers—confirmed by the United States Senate in 2003, she is the youngest person to ever hold this position; Morris Leopold Ernst, lawyer and co-founder of the American Civil Liberties Union, and Jonathan Fielding, M.D., Director of the Los Angeles County Department of Public Health. The undergraduate enrollment at Williams College is approximately 2,000 students, with a student-faculty ratio of about 7:1. Williams College has three academic divisions (languages and the arts, social sciences, and science and mathematics) that encompass its twenty-five departments, thirty-six majors, and several concentrations and special programs. Williams College has Oxford-style tutorials that require heavy student participation. Although fraternities have been phased out since 1962, Williams has about 150 student organizations with about 96% of all students participating in at least one extracurricular activity such as the Williams College Law Society, Williams College Literary Review, Williams College Medical Reserve Corps and the Williams College Nordic Ski Club. Most classes have fewer than 10 students.